| Over 100 motorcycle test passes! Home > News > Over 100 motorcycle test passes! It’s been quite a week at Inner Circle Training this week as we helped our 100th new rider obtain their full motorcycle licence by passing their motorcycle test! We are very proud of this milestone as we only opened for business on 11th May 2014 and since then have been busy establishing our reputation for the highest quality motorcycle instruction. Our base in Stockport, Greater Manchester, has evolved over that period to include a smart and warm(er!) classroom within the large warehouse building we occupy. Our dedicated training yard is available exclusively to us 7 days a week for CBTs as well as practicing the module-1 exercises if necessary. Our Direct Access courses – which are responsible for our excellent motorcycle test pass rate – include use of the Motorcycle Manoeuvring Area (MMA) at Bredbury Test Centre, which is less than 5 miles from our base. It is this test centre that we use most, meaning riders are riding on the roads that they are likely to encounter during their module-2 test from the minute we head out on the road. It is therefore little surprise that we have seen so many pass with us first time (over 75% of our mod-1 and mod-2 tests are passed first time!). But this week wasn’t just about breaking the ton, it was how this was achieved that’s interesting! First up, and our 99th test pass, was Andreas. All the way from Singapore to pass his motorcycle test! 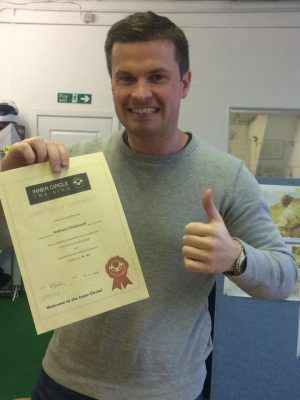 His story is familiar in part – he’d contacted a number of training schools to try and obtain his full UK motorcycle licence but found their level of customer service lacking. That’s the only familiar part of his story, though, as he lives and works as an airline pilot in Singapore! What this meant is that his time in the UK for training and tests was restricted due to his roster and it was Tracy who stepped up to sort out the logistics – something anyone who’s dealt with her knows she excels at! So he flew in to Manchester Airport on Sunday, was out training for a couple of hours with Paul on Monday afternoon, took and passed his module-1 motorcycle test on Tuesday morning before some more road-based training and then took and passed his module-2 motorcycle test on Wednesday (another first time pass!). After a quick stop back at base for a brew and to be presented with his Inner Circle Training DAS course completion certificate (to go with his official DVSA Practical Test Pass Certificate that means he can now ride any bike!) it was off to the airport again to catch his flight to Hong-Kong! Andreas with his certificate before heading to the airport to catch his flight to Hong Kong! An early start for James as he passes his motorcycle test! Next up was James, who doesn’t have quite as exotic a story! Whilst Andreas had had to deal with some very low temperatures and the threat of sleet and snow impacting on his tests (which fortunately they didn’t), James was greeted with slightly warmer temperatures for his early-morning module-2 test. An 8:20am test is the first of the day at the test centre and one we usually try to avoid as it means Paul has to get up very early to meet the candidate for their hour’s pre-test training ride! 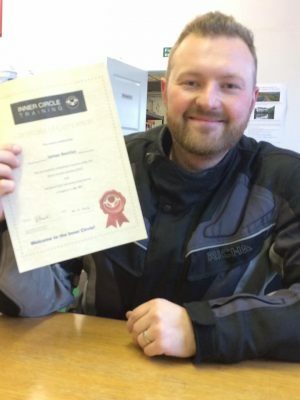 James didn’t seem phased by it, though, and sailed through the test with very few riding faults to become the 100th person to pass their motorcycle test with us! James becomes our 100th Motorcycle Test Pass! Rob completes the hat-trick as he also passes his motorcycle test! But that wasn’t the last motorcycle test we had booked this week as today (Friday) was Rob’s turn! Following an hour’s ride before the test when Paul helped him get “in the zone” and focused on what he needed to do to pass, Rob went out and aced the test to complete this week’s hat-trick of motorcycle test passes! 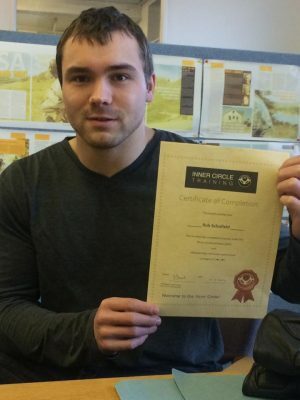 Rob passes his motorcycle test to complete this week’s hat-trick of passes!